If any of you were wondering why there was no auction report from Blackbushe last Wednesday it’s because I was at BCA Sevilla. BCA is now the biggest vehicle remarketing specialist in Europe, with two auction centres in Spain, two in Portugal, four in Germany, two in Norway, two in Sweden, two in France and one in Denmark, Holland, Belgium and Austria as well as nineteen in the UK. Altogether, the company shifts more than 1.3million vehicles a year and is heavily involved in every aspect of remarketing for fleets, including advising the optimum times for disposal. But what is most likely to interest you is what the Spanish pay for their used cars at auction. The thing to remember is that Spanish auctions are trade only. The public cannot buy at them. So auction prices are very much trade prices, on top of which you have to add a dealer margin. 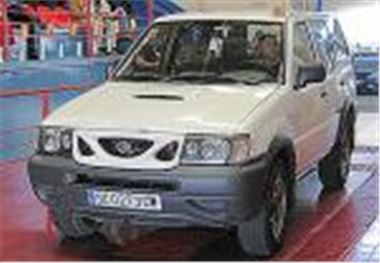 The low kilometre (21,000) year 2000 Nissan Terrano II 2.7TD Comfort in the photo sold for 10,818 Euros (£7,460), which is quite high compared to the UK. Dearest car in the sale was a 17k kms 2003 SEAT Leon 1.9TDI Sports Limited, which sold for 12,380 Euros (£8,540) against a Spanish Used Car Price Guide price of 15,130 Euros (£10,434), leaving £2,000 for a private buyer to negotiate over. An older 2001 SEAT Toledo 1.9TDI Signum with 105k kms made 8,415 Euros (£5,800) against guide price of 10,230 Euros, a 73k kms 2002 Fiesta 1.8TDDI Trend made 4,808 Euros (£4,220) against a guide price of 6,700 Euros, a 94k kilometre 2001 Peugeot 406 2.0 ST HDI station wagon made 9,616 Euros (£6,630) against a guide price of 13,101 Euros and a 135k kms 2001 Renault Kangoo Express 1.9D RTE 65 sold for 2,646 Euros (£1,825), no guide price. Of 200 lots, around 120 sold on the day, which wasn’t bad considering the Feria de Sevilla was in full swing 70kms back into town.